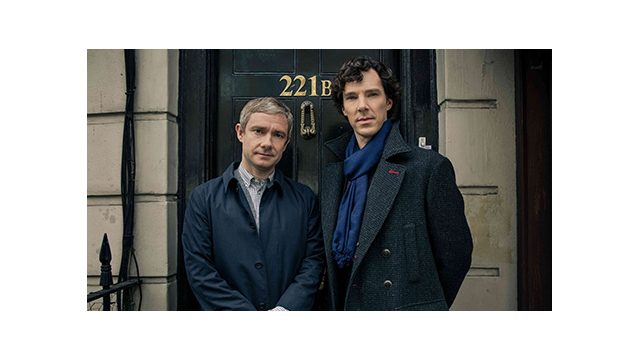 Following its impressive showing at the 2014 Emmy Awards, seven-time winner "Sherlock, Season 3" on MASTERPIECE will be re-released online for 30 days beginning Wednesday evening, August 27. The three-part series will be available on the MASTERPIECE website, PBS.org, PBS stations’ video sites and PBS station branded digital platforms, including ROKU and Apple TV. "As any of its devoted fans will tell you, 'Sherlock' is a program that should not be missed," said MASTERPIECE executive producer Rebecca Eaton. "This is a great opportunity to jump on the 'Sherlock' bandwagon — or to watch it again." "We're thrilled to give viewers another chance to enjoy the 3 feature-length films that make up this season of this brilliant drama series," said Beth Hoppe, Chief Programming Executive and General Manager, General Audience Programming, PBS. "It's just in time to enjoy a Labor Day binge and relive every Emmy-winning moment." PBS stations nationwide may also air a repeat of the third season in the coming weeks. Please check your local listings to find "Sherlock" in your area. "Sherlock, Season 3" is a Hartswood West for BBC/Cymru Wales co-production with MASTERPIECE. It was created by Steven Moffat and Mark Gatiss, and inspired by the works of Sir Arthur Conan Doyle. The executive producers are Beryl Vertue, Mark Gatiss, Steven Moffat, Sue Vertue and Rebecca Eaton for MASTERPIECE.